We’d love your help. 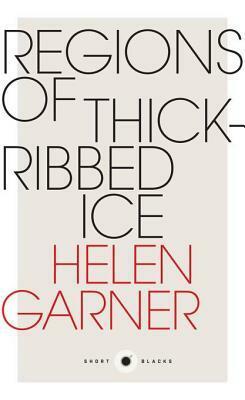 Let us know what’s wrong with this preview of Regions of Thick-Ribbed Ice by Helen Garner. They say that tourist ships to Antarctica, even more than ordinary human conveyances, are loaded down with aching hearts. Deceived wives and widowers, men who've never been loved and don't know why, Russian crew forced to leave their children behind for years at a time ... And then there are the married couples: how calm the old ones, how eager the new! - but isn't a coupl They say that tourist ships to Antarctica, even more than ordinary human conveyances, are loaded down with aching hearts. Deceived wives and widowers, men who've never been loved and don't know why, Russian crew forced to leave their children behind for years at a time ... And then there are the married couples: how calm the old ones, how eager the new! - but isn't a couple the greatest mystery of all?" "Regions of Thick-Ribbed Ice" is the tale of a journey to Antarctica aboard the Professor Molchanov. With unmatched eloquence, Helen Garner spins a tale of ships, icebergs, tourism, time, photography and the many forms of desolation. "Short Blacks are gems of recent Australian writing - brisk reads that quicken the pulse and stimulate the mind." To ask other readers questions about Regions of Thick-Ribbed Ice, please sign up. I was introduced to Helen Garner in a Creative Writing course, and subsequently found myself devouring This House of Grief. It stands as my favourite work of non-fiction. After reading Regions Of Thick-Ribbed Ice, that preference has to extend to the author herself: Helen Garner is my favourite non-fiction author. As short as it is, this little book is a glorious snapshot of an Antarctic ocean voyage, filed with humour and masterfully crafted imagery. I found it to be a lovely little interlude t I was introduced to Helen Garner in a Creative Writing course, and subsequently found myself devouring This House of Grief. It stands as my favourite work of non-fiction. After reading Regions Of Thick-Ribbed Ice, that preference has to extend to the author herself: Helen Garner is my favourite non-fiction author. As short as it is, this little book is a glorious snapshot of an Antarctic ocean voyage, filed with humour and masterfully crafted imagery. I found it to be a lovely little interlude to my day, and would recommended anyone in need of a beautiful little morsel of prose to pick this gem up. True to form, this essay is an unflinchingly honest account the authors experience visiting the Antarctic - without a camera on principle. Hilarious moments as she recounts her very real anger and hate towards the battalion photographers scrambling for "the shot" and then laments the difficulty of writing in her notebook with 3 pairs of gloves on. Garner confesses her own failing to find the right words, yet I felt she found the perfect ones. I would read anything by Helen Garner and this did not disappoint. Although I find Helen a bit annoying in this book. Perhaps not as annoying as she found herself though...! More, more, more! Why is this only 44 pages? Where is the rest of it? Surely this is just a preview of a longer work? I loved the sarcastic viewing of other passengers, the photographers in particular; I enjoyed the iceberg descriptions and the descriptions of animals (even though she didn't care for them). Only Helen Garner could treat a trip to Antarctica, of all places, with this much disdain! Still waiting for a book-length version, though. Helen goes to Antarctica without a camera on principle. Takes notes and debates the experience of the event as opposed to recording it in any form. However after reading about two gale force storms I am not inclined to sign up for a voyage of my own. I thought this was a full-length book, but it's a short essay about Garner's trip to the Antartica. What I love about her writing is that with her keen eye, she is always somewhere in her work, and often the way she presents herself is as a writer focusing, and sometimes like a curmudgeon. What an enjoyable short story about Helen's trip to Antarctica and a great springboard for my Antarctica reading before our trip. I want more. She can do no wrong! Like all Garner, I just wanted this to go on for another 3000 pages for me to sink into. Helen Garner was born in Geelong in 1942. She has published many works of fiction including Monkey Grip, Cosmo Cosmolino and The Children's Bach. Her fiction has won numerous awards. She is also one of Australia's most respected non-fiction writers, and received a Walkley Award for journalism in 1993. Her most recent books are The First Stone, True Stories, My Hard Heart, The Feel of Stone and Joe Helen Garner was born in Geelong in 1942. She has published many works of fiction including Monkey Grip, Cosmo Cosmolino and The Children's Bach. Her fiction has won numerous awards. She is also one of Australia's most respected non-fiction writers, and received a Walkley Award for journalism in 1993. Her most recent books are The First Stone, True Stories, My Hard Heart, The Feel of Stone and Joe Cinque's Consolation. In 2006 she won the Melbourne Prize for Literature. She lives in Melbourne.